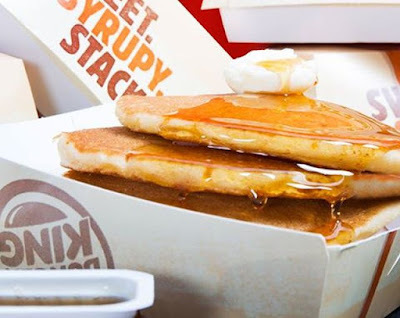 Looking to offer breakfast for under a buck, Burger King brings back their 89-cent pancakes deal at participating locations nationwide during breakfast hours. Available for a limited time, you can get three pancakes with syrup and butter for 89 cents. As an added bonus, if you happen to be in Los Angeles, CA, DoorDash will offer no delivery fees for Burger King orders placed on November 15 through 21, from 6 AM to 10 AM at participating locations. Between the pancakes and the chain's 10 chicken nuggets for $1 deal, Burger King is really looking to offer the most bang for your buck among the major fast food chains.